Web presence is such an important thing now days and if no one can Google you that means you don’t exist! 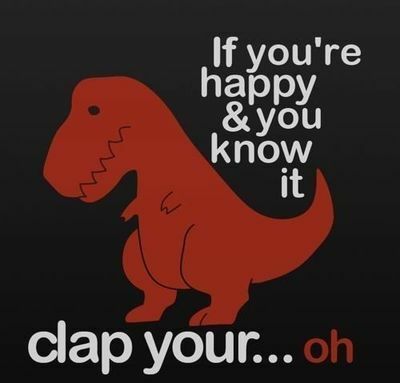 You’re a ghost, you’re off the grid and unfortunately a dinosaur. To prove we existed, the Cowlick Appeal needed a site! An official home on the World Wide Web! We had already created a body of work that we were very proud of and wanted to share. But the issue was, how do we present that work properly? And most importantly, how do we portray and present the story of The Cowlick Appeal in a simple, different, beautiful, and intuitive way? To achieve each of those objectives we first researched what others were doing and pulled inspiration from a handful of sources like, Digital Telepathy, Magnetic Creative, Paypal UK, and Google Hangouts. Where we “OOOH”-ed and “AHH”-ed over each website. Will the user be confused if they go to this page? Will they know how to get back to the homepage? And can they access this specific page from the homepage? Questions that you typically take for granted when you yourself are going through your favorite sites. Think about it! Someone made a roadmap for you to check out and like your friend’s pictures on Facebook! After we figured out what pages were needed and how they were all going to connect, we went to the “Oh-So-Magical-White-Board-of-Truth” (or as others like to call it, a white board) and wireframed the hell out of it! 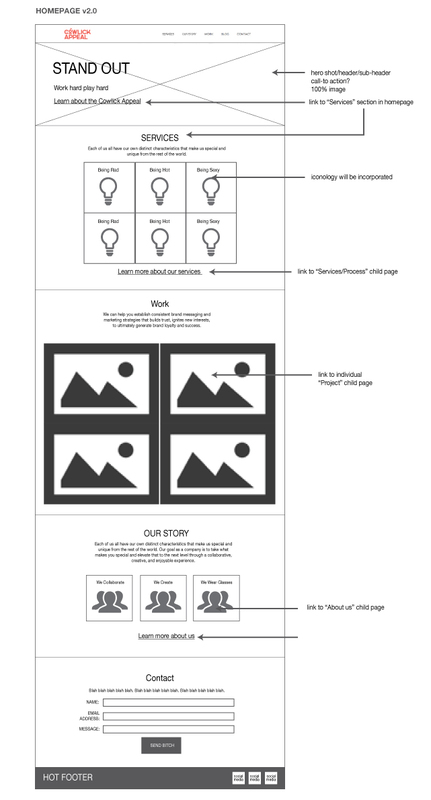 While doing that we also included the content map for each page so we could figure out what photos and copy were needed. Doing it this way allowed us to delegates and multi-task jobs among the team. 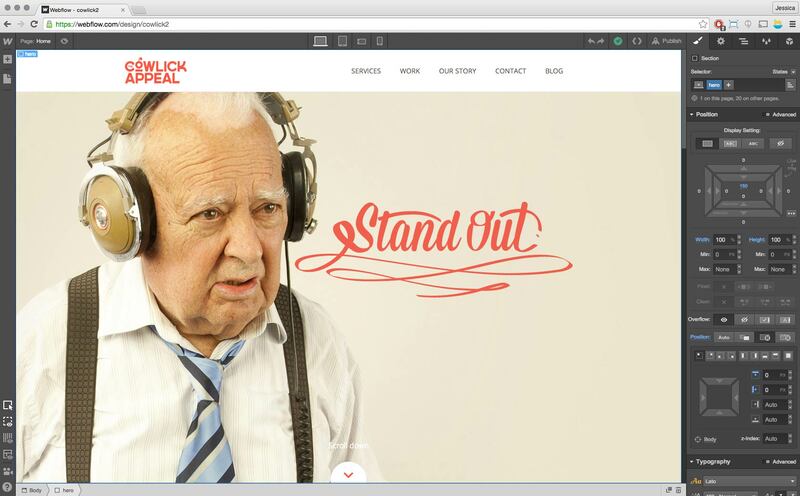 To build the site we used this wonderful web application called Webflow. If you haven’t heard of it, please check out their site! It’s a great tool to build interactive mock ups. No need to Photoshop! You create the site for desktop and all mobile devices all in one place and preview the working site instantly. What makes it so rad, in my opinion is that the interface is built similar to Photoshop. You don’t need to necessarily understand code to make a site. So you people out there who are afraid of web design because of the coding part, have no fear. Webflow is here. When I look back, the design phase of the site took the longest. We went through rounds and rounds of versioning: adding new sections, taking old sections out, swapping out photos and replacing those photos. 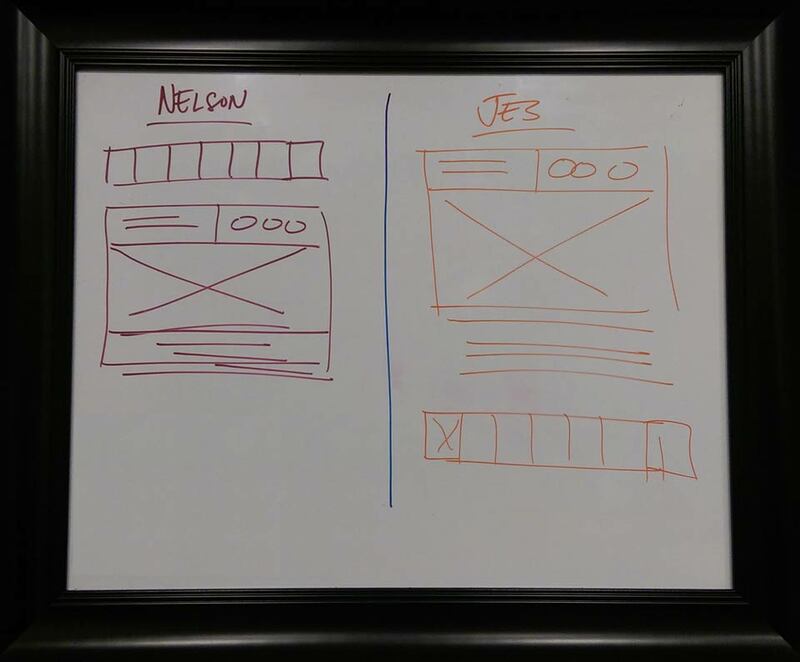 There were times when our original wireframe had to be scrapped and replaced with a new one. In theory it would work, but when actually executed and applied to the many rules of web design, it failed on multiple levels. Navigating through parts of the site was becoming difficult, and when transitioning to mobile devices, the layout was looking bad. So back to the “Magical White Board” we went. We spent so much time on the design, we later realized that we needed to also focus time on our copy. Design and user-experience only makes up ⅔ of a website. People sometimes fail to remember that copy, the voice of your website, and in our case our company was crucial. A voice for any brand is crucial. As a team we then spent a significant amount of time writing and editing our copy. Even sending it to multiple people to review and edit as well. We soft launched the site around the beginning of December we tested the website for about 2-3 weeks, making sure the site worked correctly across all platforms. To user test, we sent the site out to our personal friends asking for their input and thoughts. Some of the input we got back was super helpful which made us go back and rethink our design decisions. Testing websites are very important. I can’t emphasize that statement enough! 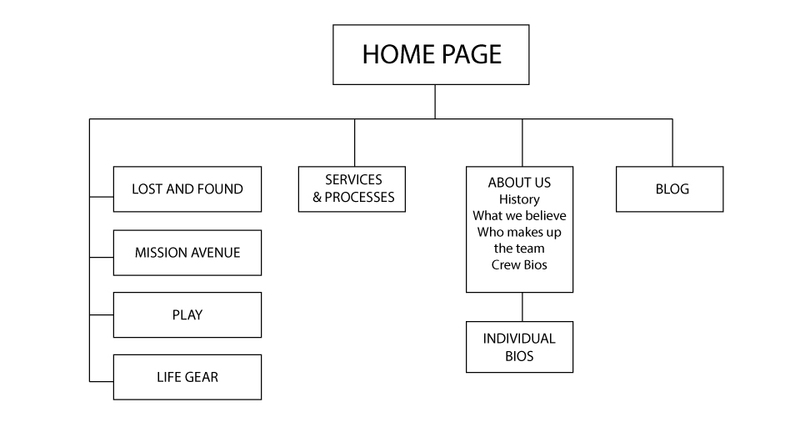 As a company, we internally knew how to navigate through our site. But would a user, who had no idea who The Cowlick Appeal was, know how? Would other new users know where to go to learn about us? Would they know where to go to see our work? More importantly, would they know where to go to contact us? We aren’t mind readers dammit if we were, the world would be a different place. Because of this fact, we had to test the site out and understand what people were feeling, seeing, and understanding. But as I think of cookies and look back at these past 3 months of working on the Cowlick Appeal site, I realize that this was a labor of love by the entire team. We hope you can see that each time you scroll down a page, read through the copy, and click on a link. And just like how Tron fought for the user, we will fight for you. We made this site for you, and we hope you find that appealing.